Recently, I met someone new. At first glance, due to his profession and appearance, he reminded me of three people I had been close to a few decades ago. Immediately, my mind decided that he was a mash-up of these folks and started scanning the conversation, his gestures and expressions for evidence that, indeed, he was such a composite character. Luckily, I caught onto my mind’s machinations before it could fully conjure this fictional person. “I know nothing,” I reminded myself, although not in Sgt. Schultz’s fake German accent. 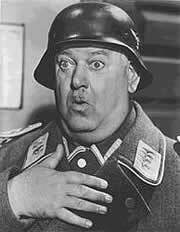 For those too young to remember, he played the fool in Hogan’s Heroes. In Zen, spiritual aspirants are also known as fools, willing to encounter the next moment with neither fear nor anger, no matter what happens. In short, being a fool means not needing to be “right”. Although it was quite possible that some of my assumptions and first impressions would turn out to be accurate, the reality of this person might also be quite different from my ideas. Could I drop my internal chatter and enter the moment, rather than analyze, anticipate and predict? Before I started practicing Zen and meditation, I often believed that the portraits my high octane brain sketched, often from just a few visual cues, were real. I prided myself on being able to size people up, get an instantaneous “read” on them. Sometimes my intuitions and hunches were correct, other times they were breathtakingly off the mark. Now I’m aware that many of my thoughts, and the feelings they generate, are like reruns: unoriginal, frequently fictional and, even if entertaining, offer little substance or insight. It’s best to pay them peripheral attention, if any at all. Still, constant vigilance is required to avoid getting sucked into the soap operas they create. This time, I redirected my attention to my breath, listened and responded. The conversation flowed. Hours passed. It was a relief to tune in, to be the fool. « Does “commitment” demand “sacrifice”?